My favourite nut milk brand is 100% Rude Health, despite the majority of their nut milks really being rice milk with approximately 1% nuts. Perhaps it's the addition of the sunflower oil but their almond milk in particular is so creamy and works beautifully in my morning coffee and porridge. I decided to try out their new Ultimate Almond Milk, which is just natural spring water and raw almonds (8% - very high for a commercial nut milk!). So far, suuuuuper creamy! I also picked up their Hazelnut Milk, which I haven't tried yet but I'm really excited to try it and make a praline-esque hot chocolate! The Biona Organic Apple Cider Vinegar is something I've been wanting to try for ages - for salad dressings, to using it as a balancing acid toner (diluted!). It may simply be one of those bogus, 'superfoods' but hey, ain't no harm in trying right? I also picked up a bag of the Biona Organic Spelt Fusili Brown, as I've wanted to try spelt pasta for a while - despite not being a huge pasta lover - and recently tried brown rice pasta and really enjoyed it. FYI - these are the tiniest little spirals of pasta ever! Now, you can tell from this post and the accompanying image I'm a bit of a chocoholic, right? First up we have the Paleo Foods Company Cocoa & Hazelnut Grain-Free Granola - extortionately expensive but nonetheless, I was feeling spendy, so insisted. 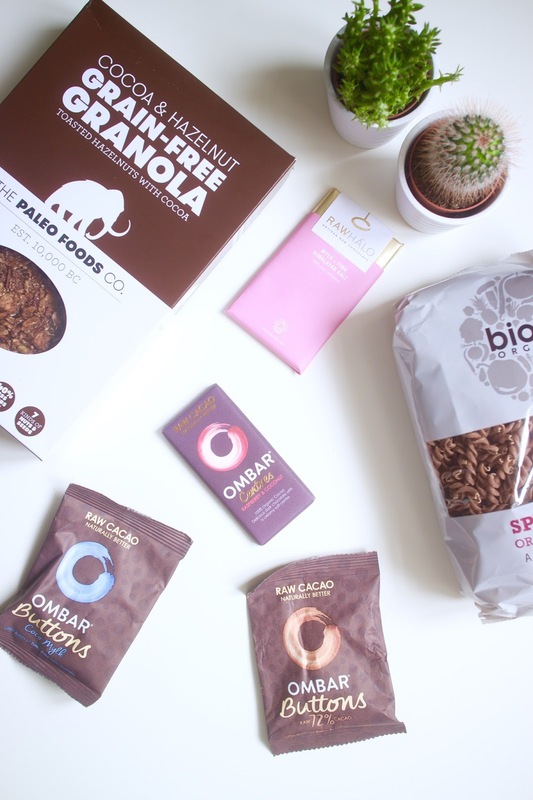 I'm a huge fan of Madeleine Shaw's Grain Free Chocolate Granola from her Get The Glow book, but don't make it too often as it's quite expensive to make. Now this is essentially a very similar granola, but instead of banana as the sweetener, they use honey. I'm so keen to try this out with some coconut yoghurt or Greek yoghurt, or even a handful as a snack. Other chocolate themed products include the Ombar Coco Mylk Buttons (I've had these already and they are so good! ); Ombar CocoMylk Bar; the new Ombar Raspberry and Coconut Centre which I'm very keen to try - the 'centres' are truffle like, apparently; and from Raw Halo, I picked up the Raw Halo Dark + Sweet Orange Raw Chocolate Bar and the Raw Halo Mylk + Pink Himalayan Salt Raw Chocolate Bar - both sound heavenly, though I desperately want to try their Mylk + Salted Caramel Bar *inserts-heart-eyed-cat-emoji*. I'm saving all of this chocolate as they're such expensive, tiddly bars. BUT, all of this raw chocolate has got me inspired to try making raw chocolate again, so watch this space...! Phew, my pockets are now very much empty but my cupboards are full, and my belly most likely will be soon too. I'll report back to you my thoughts both here and on social media, so make sure you're following me on Instagram and Twitter. I couldn't splurge like this all the time, but occasional hauls like this are fun and a good opportunity to try out new health foods, snacks and treats that aren't necessarily easily accessible. Whilst I say I can't afford to place extravagant orders like this all the time, I must admit I'm already eyeing up the Livia's Kitchen Raw Millionaire's Bites which seem impossible to get hold of outside of London (or even in London, apparently! ), and the newly launched Loving Earth raw chocolate! Someone, help me! Have you tried any of these products? Do you enjoy shopping in health/wholefoods shops? What's your opinion on expensive healthier treats/snacks/foods?